Common reasons why content updates fail in GFI MailEssentials (Part 1 of 3)There can be various reasons why one or more GFI MailEssentials Anti-Spam modules may fail to download the latest updates files or to update the local engines of GFI MailEssentials.Generally a notification email for each update failure will be sent to the administrator. A notification email can look like this: “GFI MailEssentials notification: Antiphishing Database Update Failed.”How would you judge and handle such notifications?First we need to find out, if this is a permanent or sporadical event. If it is an event that occurs sporadically, then you may ignore this notification email.Reason Nr. 1: Bad network connectionA good reason for a sporadical event is in most cases a bad network connection with our update server that may have caused a timeout event on the client machine.However, if the event occurs with every download attempt, then it is recommended to investigate further. A permanent content update failure can be a serious threat for GFI MailEssentials.GFI MailEssentials would not only be outdated, but it might also not be able to block the latest spam trends successfully. 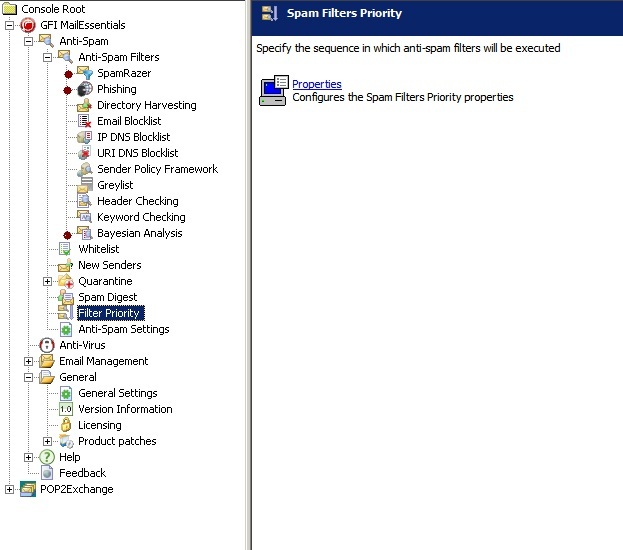 Therefore, it is very important that GFI MailEssentials is kept up-to-date including all its anti-spam engines like SpamRazer, Anti-Phishing, etc.In this case GFI MailEssentials has failed permanently, so I have decided to do some pre-checks to ensure that this issue has not been caused by a simple reason.Reason Nr. 2: License Key expiredIn some cases an expired license key may be the key reason why GFI MailEssentials is not allowed to download the latest updates files from our update server.For this pre-check I will log on to the GFI MailEssentials machine. Then I will open the GFI MailEssentials configuration from the Start menu >> All Programs >> GFI MailEssentials >> GFI MailEssentials Configuration (1).In the GFI MailEssentials configuration I will navigate to the node GFI MailEssentials >> General >> Licensing >> Properties (2). A dialog box will pop up and will display the current information about the license status (3).If the license key has been expired or the licensed user has been exceeded, then GFI MailEssentials will not be able to work properly or it will not be able to download the update files from our update server.If the license status key has been expired, then I need to ensure that I am using the latest license key for GFI MailEssentials. If necessary, I will need to buy a renewal license key to ensure that the license key allows me to download the latest updates files from our update server.In my case the license key was correct and valid. Furthermore, the license key allows me to download the latest update files.Reason Nr. 3: Licensed Users exceededThe license status shows me some useful information. It counts 25 users and my license key allows me to use up to 25 users. So, the licensed users have not been exceeded. If it exceeds the amount of licensed users, then I would need to verify whether the license key needs to be upgraded for further x amount of users.The following knowledge base article explains how the users are counted by GFI MailEssentials and how unnecessary licensed users can be removed from the user list.http://kbase.gfi.com/showarticle.asp?id=KBID002577In the next step I will need to check whether only one specific or all Anti-Spam modules fail to download the update files. GFI MailEssentials has three modules which periodically download update files from our update server:• SpamRazer• Phishing• Bayesian In the next post I’ll talk about some further tricks to troubleshoot common issues like that. If you have any queries in the meantime, feel free to comThere can be various reasons why one or more GFI MailEssentials Anti-Spam modules may fail to download the latest updates files or to update the local engines of GFI MailEssentials. 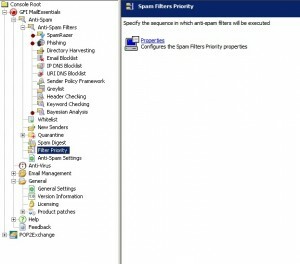 There can be various reasons why one or more GFI MailEssentials Anti-Spam modules may fail to download the latest updates files or to update the local engines of GFI MailEssentials. How would you judge and handle such notifications? First we need to find out, if this is a permanent or sporadical event. If it is an event that occurs sporadically, then you may ignore this notification email. A good reason for a sporadical event is in most cases a bad network connection with our update server that may have caused a timeout event on the client machine. However, if the event occurs with every download attempt, then it is recommended to investigate further. 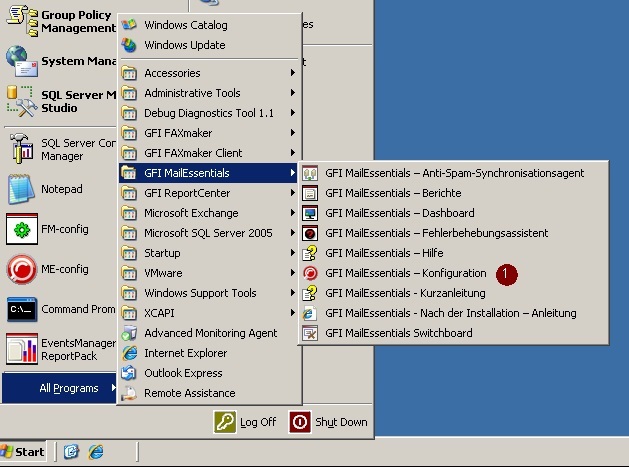 A permanent content update failure can be a serious threat for GFI MailEssentials. GFI MailEssentials would not only be outdated, but it might also not be able to block the latest spam trends successfully. Therefore, it is very important that GFI MailEssentials is kept up-to-date including all its anti-spam engines like SpamRazer, Anti-Phishing, etc. In this case GFI MailEssentials has failed permanently, so I have decided to do some pre-checks to ensure that this issue has not been caused by a simple reason. In some cases an expired license key may be the key reason why GFI MailEssentials is not allowed to download the latest updates files from our update server. For this pre-check I will log on to the GFI MailEssentials machine. Then I will open the GFI MailEssentials configuration from the Start menu >> All Programs >> GFI MailEssentials >> GFI MailEssentials Configuration (1). In the GFI MailEssentials configuration I will navigate to the node GFI MailEssentials >> General >> Licensing >> Properties (2). A dialog box will pop up and will display the current information about the license status (3). If the license key has been expired or the licensed user has been exceeded, then GFI MailEssentials will not be able to work properly or it will not be able to download the update files from our update server. 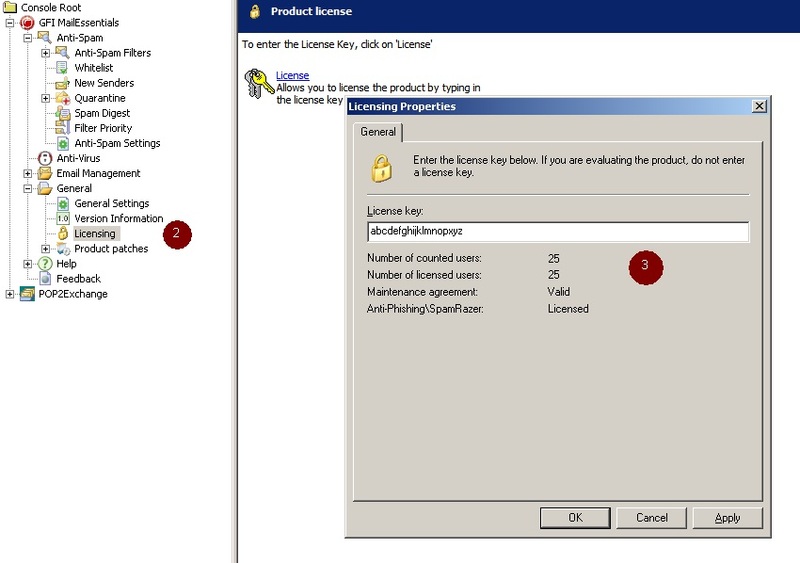 If the license status key has been expired, then I need to ensure that I am using the latest license key for GFI MailEssentials. If necessary, I will need to buy a renewal license key to ensure that the license key allows me to download the latest updates files from our update server. In my case the license key was correct and valid. Furthermore, the license key allows me to download the latest update files. The license status shows me some useful information. It counts 25 users and my license key allows me to use up to 25 users. So, the licensed users have not been exceeded. If it exceeds the amount of licensed users, then I would need to verify whether the license key needs to be upgraded for further x amount of users. The following knowledge base article explains how the users are counted by GFI MailEssentials and how unnecessary licensed users can be removed from the user list. In the next post I’ll talk about some further tricks to troubleshoot common issues like that. If you have any queries in the meantime, feel free to comment. First we need to find out whether this is a permanent or sporadical event. If it is an event that occurs sporadically, then you may ignore this notification email. A good reason for a sporadical event is, in most cases, a bad network connection with our update server that may have caused a timeout event on the client machine.